Hey friends, guess what? It’s zucchini season! Are your gardens overflowing with these very versatile vegetables? 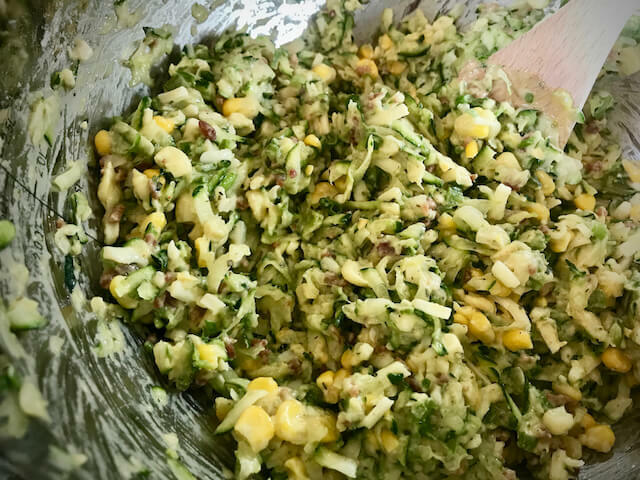 Are your coworkers and/or neighbors pawning off extra zucchini on you because they don’t know what to do with’m? OR, do you just want to make something insanely delicious that everyone in your family will adore?? 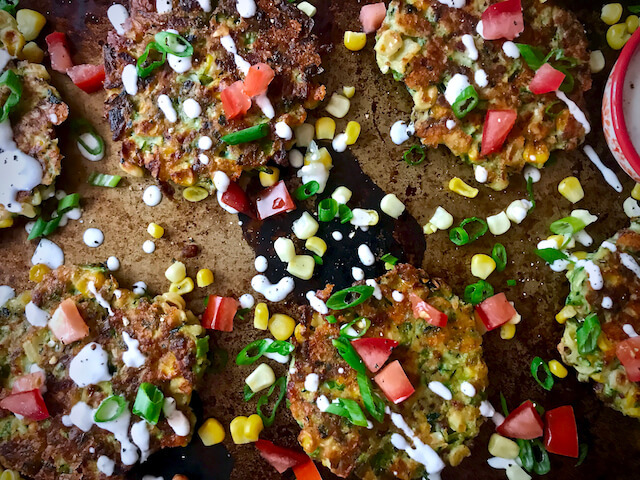 I’ve got just the thing for you… These dangerously delicious Zucchini, Corn, and Bacon Fritters. 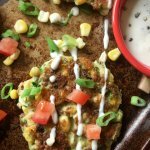 I made these on a whim one morning because I had been playing with some recipes to post on this here blog, and I just got a hankerin’ for some zucchini fritters. Truthfully, I tried making something like this once before years ago, and it went all sorts of wrong. So I was a little hesitant to try it again, but man alive- this time, Everything went right, And these fritters were stupid good! One morning Eric woke up to the whole house filled with the smells of these cooking, and he came down to eat the entire first batch. As a result, I had to make another batch immediately just so I could photograph. 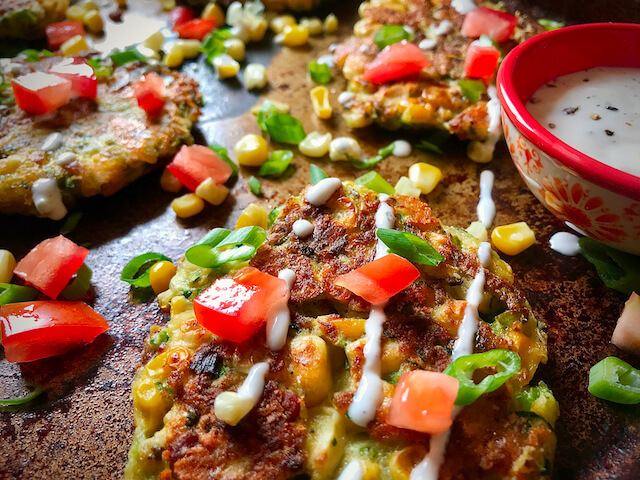 But I wasn’t too terribly upset about making another batch… because y’all, these are the best zucchini fritters that I’ve ever tasted in my life! 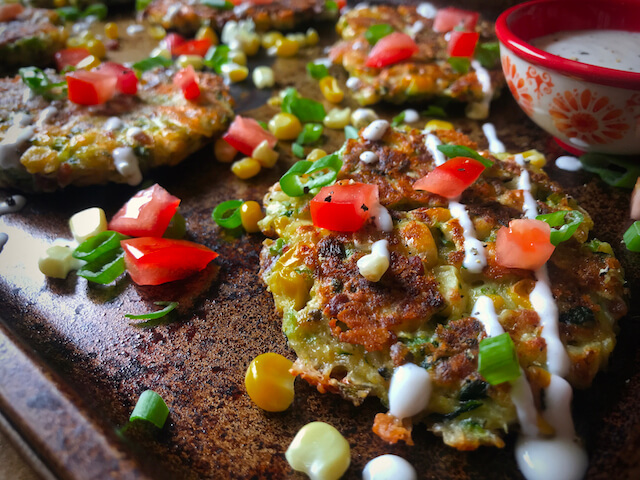 Right now, I’m on the ‘make zucchini fritters every couple days’ plan, and I’m not mad ’bout it. When Eric was eating them, he was convinced that they were rich, delicious potato pancakes. 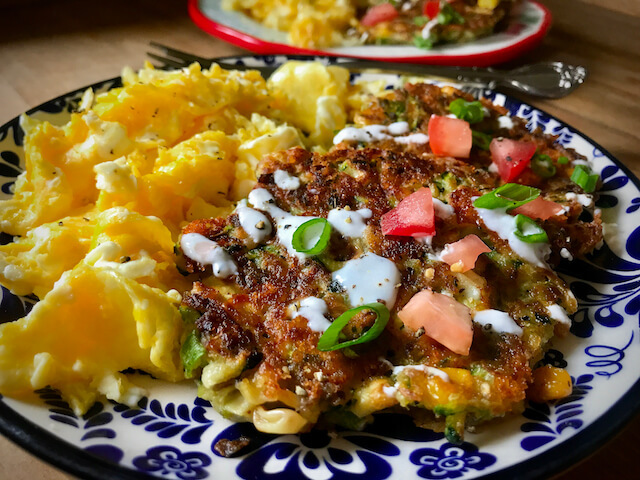 And he’s not too wrong- somethin’ about them makes you feel like you’re totally eating a hearty lil’ Irish Potato Pancake. I wasn’t even goin’ for that, but thank God for happy accidents, am I right? 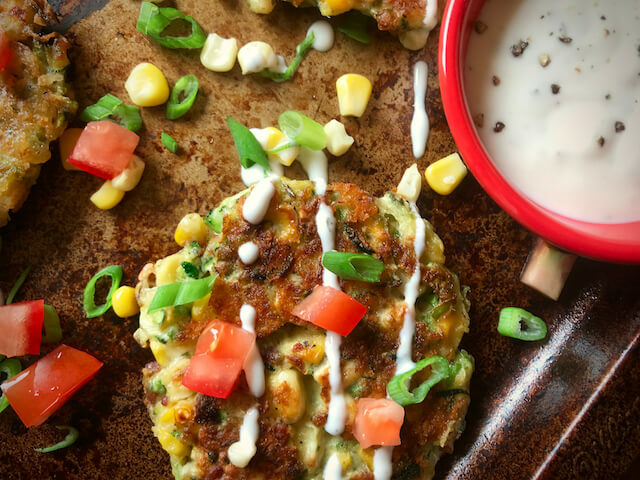 They are heavenly, and an extra-tasty way to get some extra veggies in your life. I’m warning you, you’re probably going to want to triple the batch. They taste good hot off the skillet, good lukewarm after they’ve been sitting as you try to find good light for photographing, and even good cold, outta the fridge (not saying that I ate them cold outta the fridge or anything…). They also happen to be easy as can be to whip up. 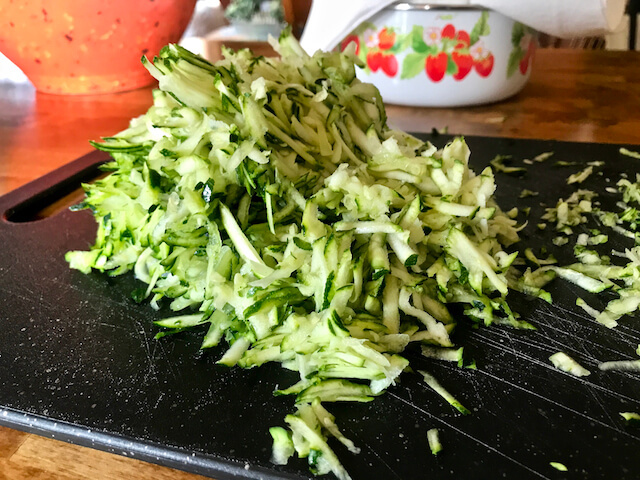 But I really can’t stress this part enough- you really, really need to get as much excess liquid out of the zucchini as humanly possible. 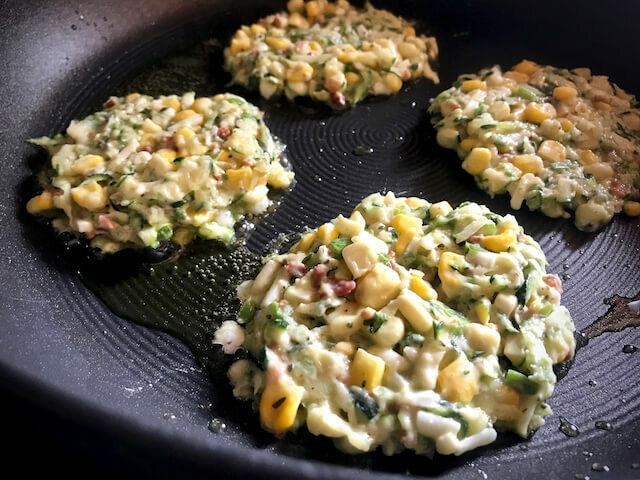 Otherwise they won’t crisp up for you, they’ll end up watery in the pan, and ultimately it’ll just be a waste of good zucchini, corn, and bacon. We don’t want that. I’ll show you some tips to get that pesky extra water out, and you’ll totally be good to go, I promise ya! Let’s start out with the star of the show, zucchini! 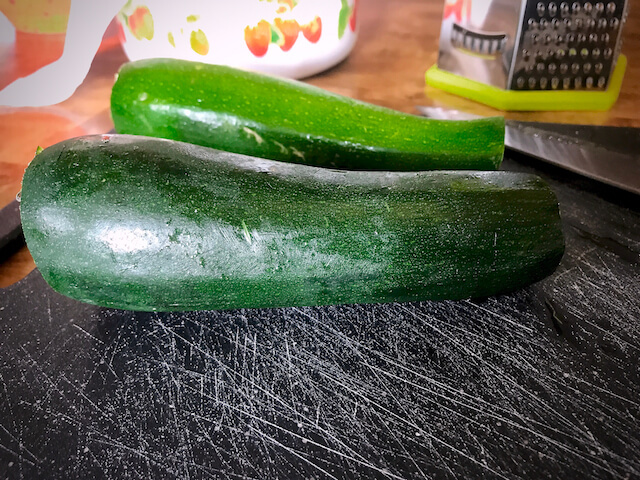 You’ll need two medium-sized zucchinis. 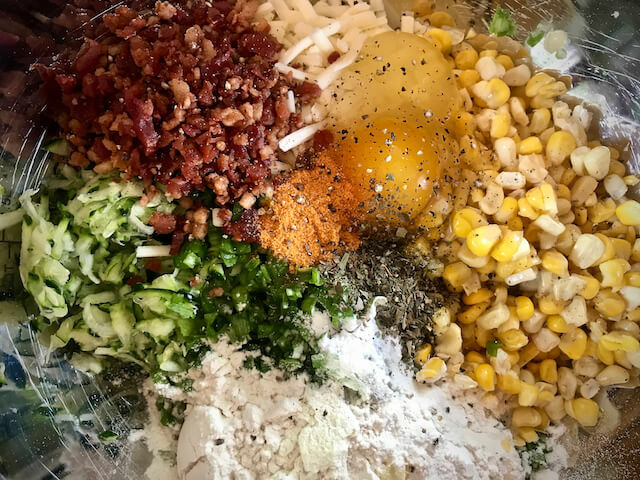 If you happen to have a food processor, you can do that too. 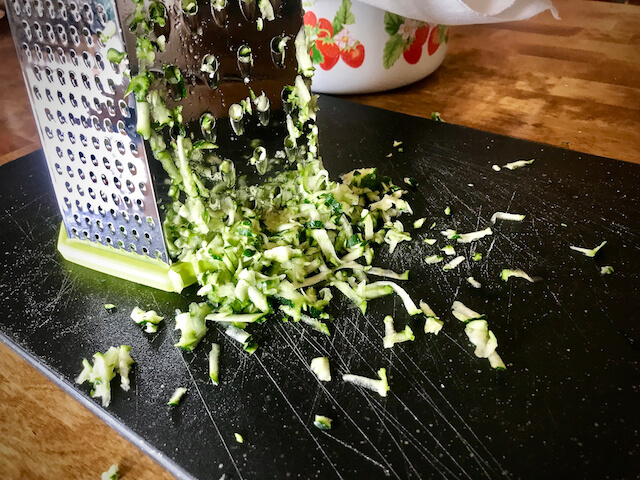 I like to grate mine, just because I hate cleaning the food processor. I also need to work on my arm strength. Haha! 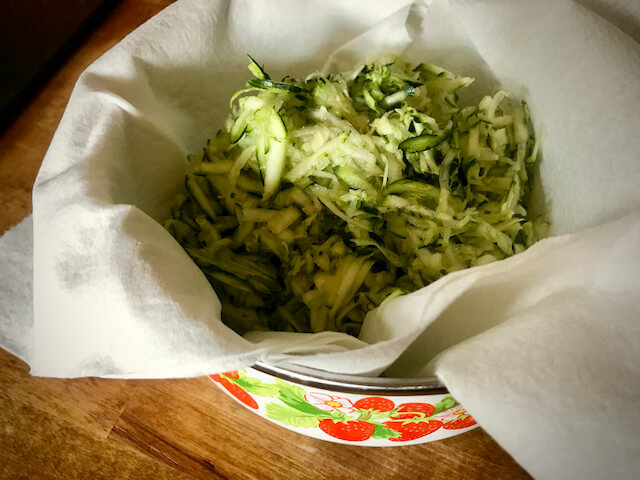 Let’s take a minute to talk about straining our zucchini very well. Although this recipe is insanely easy, it can be messed up if you don’t strain it correctly. In this photo, I’m actually using a few layers of paper towels because, fancy that, my flour sack towels were nowhere to be found. (Pepper likes to hide my towels. I wish I was kidding… three-year-olds are so much fun!) You absolutely can use paper towels to do this. But to be honest, your paper towel might break, and it’ll just be a lil’ messy. I highly suggest using flour sack towels or cheese cloth. I prefer flour sack towels because they are reusable, where cheese cloth (some people might argue this) isn’t really reusable. 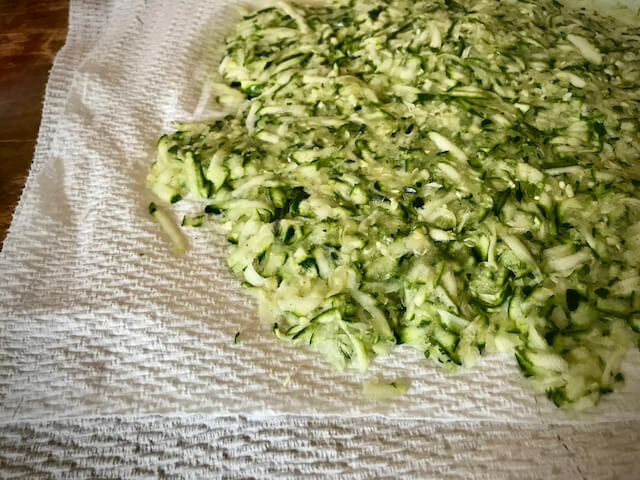 So basically, you just pile the grated zucchini onto the flour sack towel/cheese cloth/paper towel, ‘close’ it by bunching it up at the corners, then just squeeze your lil’ heart out! 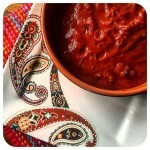 Here’s the flour sack towels I prefer: Click here! Here’s the cheesecloth I buy: Click here! do this step? I suppose not. But dang it, this method with these exact steps turns out so good, that I’m gonna go ahead and suggest it. It only takes an extra minute, so why not? Now, grab some green onions (aka scallions), and chop’m up. 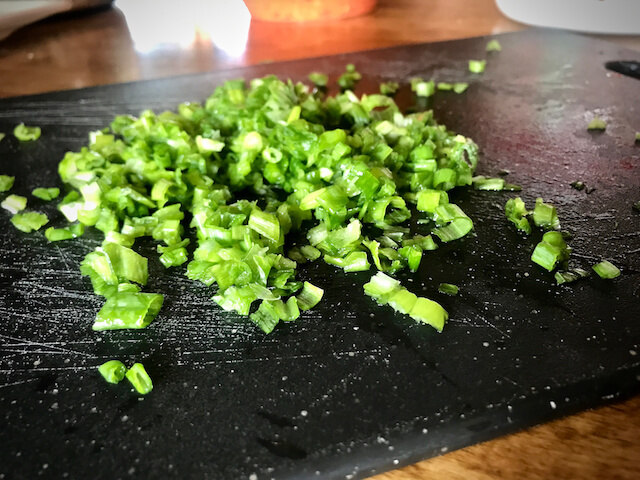 I chopped up about 4 green onions- both the green & white part! 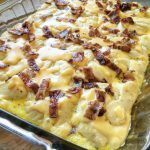 teaspoon basil, 1/4 cup all purpose flour, one egg, five tablespoons real bacon bits, 1 teaspoon baking powder, and last but not least, half a cup of mozzarella! 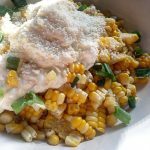 Let’s talk about the corn real quick: You can use fresh, frozen, or canned. If you use frozen, make sure it’s thawed and drained well. fritters. Spray the tops of the fritters with a lil’ cooking spray. 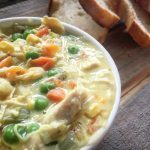 I use avocado oil cooking spray… you can find it at just about any grocery store, or just click here for a pretty good bulk deal. Pan-fry until they turn a beautiful golden brown on both sides; about 2-3 minutes per side should do it. Add the remaining olive oil, and repeat with remaining batter. And now for some pretty lil pictures of em! I just drooled a lil, did you? So ridiculously good. Top’m off with some chopped green onions and fresh tomatoes, and a side of Skinny Ranch– Greek yogurt or sour cream is good too! Or eat them straight outta the fridge cold, because I have never done that and have no idea what that tastes like… so I just need you to tell me if it’s good. okay, I have- they’re even amazing cold! We don’t judge around here. Whatever you choose to do, take it from me- make these immediately, and for the rest of your lives. 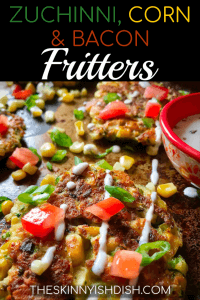 Easy, delicious, and family friendly fritters that are full of flavor and on the lighter side. 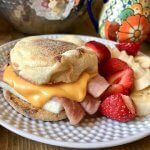 Perfect for breakfast, brunch, or dinner! 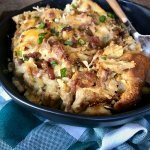 In a large bowl add grated zucchini (that has been strained very well- see above for photos), corn, bacon, egg, cheese, flour, baking powder, green onions, seasoned salt, and dried basil. Stir together until combined well. Heat 1 tablespoon olive oil in a large non-stick skillet over medium heat. 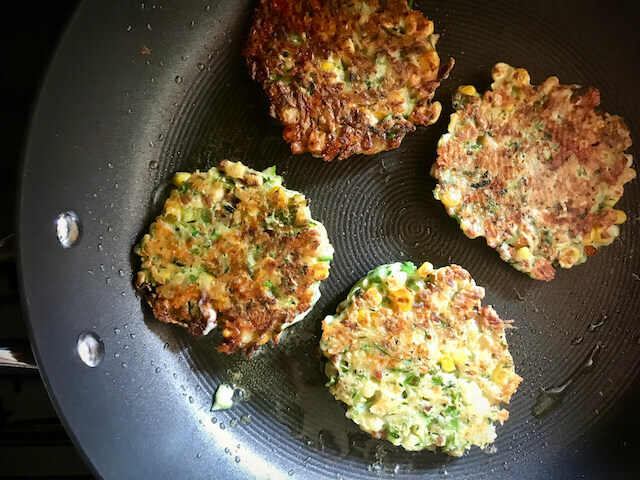 Place 4-5 1/4 cup sized portions onto the pan then gently press down with a spatula to flatten into fritters. Spray tops of fritters with a lil' cooking spray. Pan-fry until golden brown on both sides, 2-3 minutes per side. Remove from pan and set aside. Add the remaining olive oil, and repeat with remaining batter. 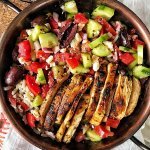 Serve with freshly chopped tomatoes & green onions and dip into sour cream or greek yogurt, on the side of some grilled chicken, or add it to a delicious breakfast spread. *See step by step photos to learn how to strain your zucchini very well. 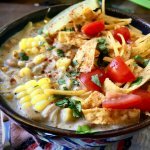 *If using frozen corn- be sure to thaw and drain, very well. 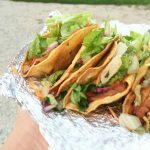 Thank you for this recipe i made them in my air fryer and they came out great. You’re welcome. I’m so happy you enjoyed, Deb! Thanks for letting me know they work well in the Air Fryer too! Can you omit the cheese? Family LOVED these! They asked me to make them for breakfast with fried eggs on top and a side of bacon! When do we add in the egg? In the first instruction with all the other ingredients. I forgot to add that in. Sorry! It’s fixed now. I hope you enjoy! 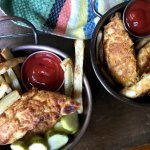 Made these in my air fryer, used spray no olive oil- sooo good! Thanks for the recipe! What temperature and how long did you air fry them for? Thanks!